First things first: I am a garlic lover! This recipe is just awesome. 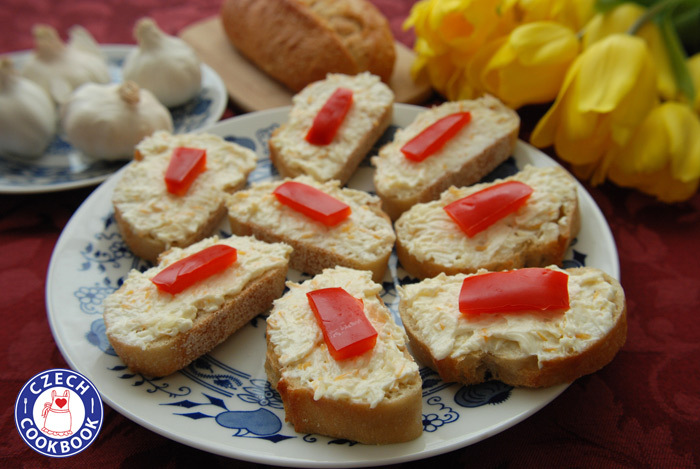 We had some spreads just like this one in Czech Republic, never that good! If you like raw garlic, try this. It is to die for, seriously! Moc dekuji Kristyna! I made this when my kids and grandkids came to our lake cottage over Labor Day. They liked the dip–I didn’t tell them what was in it. We call it Česneková pomazánka shortly Česnečka. Thank you, we made this for Christmas Eve, and it was such a hit we decided it will have to become a tradition. Delicious! Merry Christmas! That is wonderful! 🙂 Thank you and Merry Christmas and all the best in new year! family loves garlic especially grandson. making it tomorrow. my gr grandfathers name was mazanec, do you know anything abt mazanec easter bread. he grew up in bohemia. Love your cooking demos and recipes. Have a Great holiday ! I hope you enjoyed the garlic spread. I do have a recipe for Mazanec on my website. Thank you! Merry Christmas! My friend hosts a garlic nosh every fall. Each guest brings a food that features garlic and someone judges the recipes and award prizes. It’s lots of fun! Many of the guests are gardeners so there are lots of interesting dishes. Next year I am going to take this one – thank you!